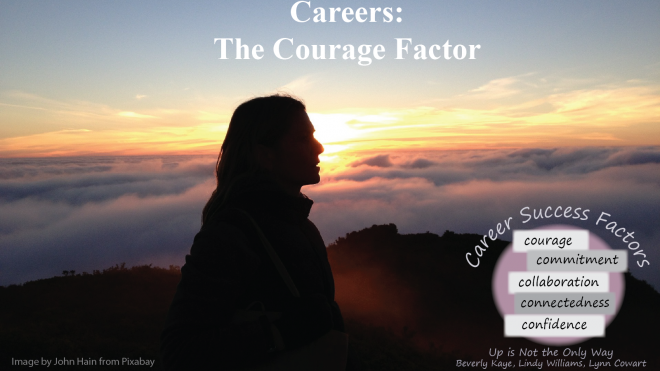 In a blog last month I listed five factors that bring career development to life – Courage, Commitment, Collaboration, Connectedness and Confidence. While all five play important roles in career planning and management – in navigating a relevant and rewarding career – one of the five is key to fueling the launch and powering the progress of a career journey. 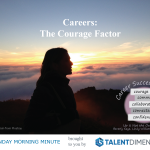 That one is Courage – courage to take a first or a next career step. Think about your first step into the world of work – the first time you took a job that would yield a real paycheck. That step, whether flipping burgers or standing on a corner waving a sign promoting a mattress store or maneuvering a courier bike through traffic, took courage. Think about what it took to walk into an office and ask if there were openings. Consider how you felt just before or just after you hit the ‘enter’ key to send off that first short resume or inquiry. Those actions took courage. Courage launches careers. And courage fuels careers. Some people are more naturally equipped to charge ahead even in the face of possible failure while others need more encouragement. Some have more barriers – seen and unseen – to overcome. The good news is that the career courage needed to break through ceilings – glass or otherwise – and bridge functional silos – real or perceived – can grow with each step taken. Managers can contribute to that growth by reaching out, by coaching, by sharing stories of their own journeys and by recognizing when employees step out – maybe beyond their comfort zones – to make their career interests known. Courage comes from within but can be nurtured by managers and leaders who care and get involved. 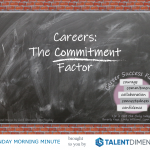 When your organization’s ready to talk about career processes, contact Talent Dimensions to learn from our decades of experience helping clients build powerful, sustainable and inclusive employee growth and development strategies.